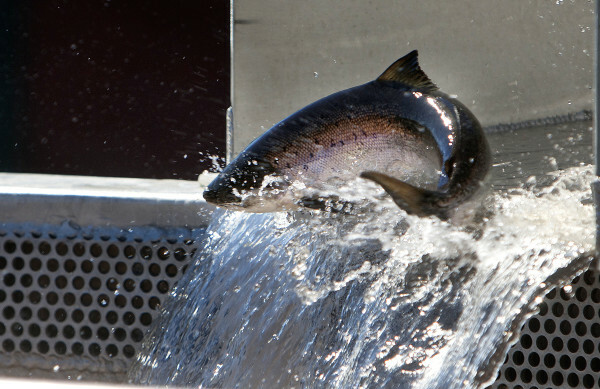 An Atlantic salmon makes its way to a holding tank at the Milford Dam fishway at Brookfield Energy in Milford Wednesday. 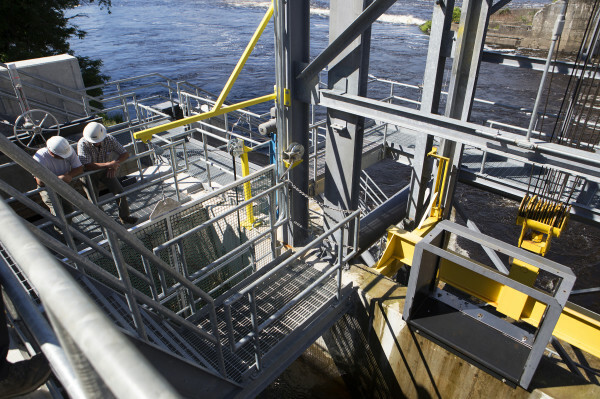 After more than three decades capturing Atlantic salmon at the Veazie Dam, that operation has moved to Milford, where a new fishlift was unveiled in 2014. Part of the Milford Dam fishway is seen at Brookfield Energy in Milford Wednesday. 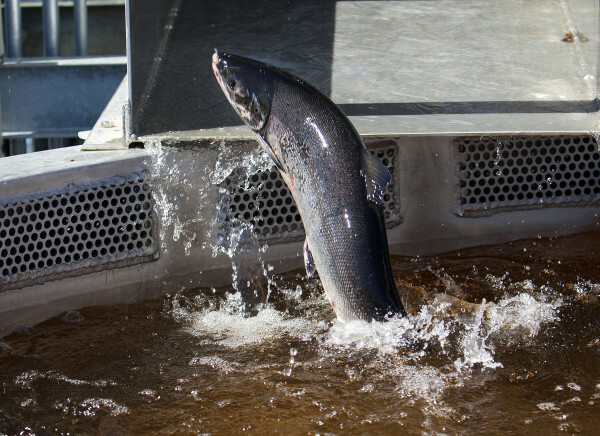 After more than three decades capturing Atlantic salmon at the Veazie Dam, that operation has moved to Milford, where a new fishlift was unveiled in 2014. 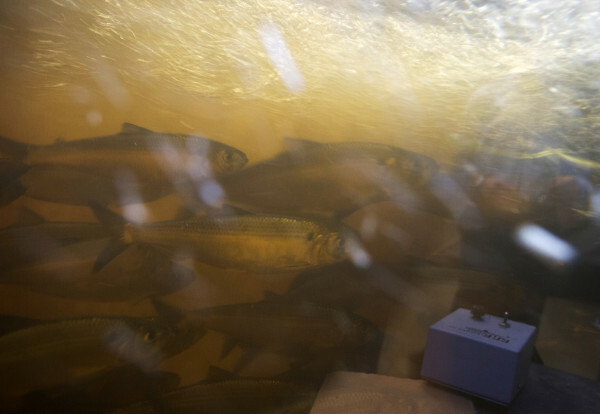 River herring are seen through a viewing window at the Milford Dam fishway at Brookfield Energy in Milfrod Wednesday. After more than three decades capturing Atlantic salmon at the Veazie Dam, that operation has moved to Milford, where a new fishlift was unveiled in 2014. 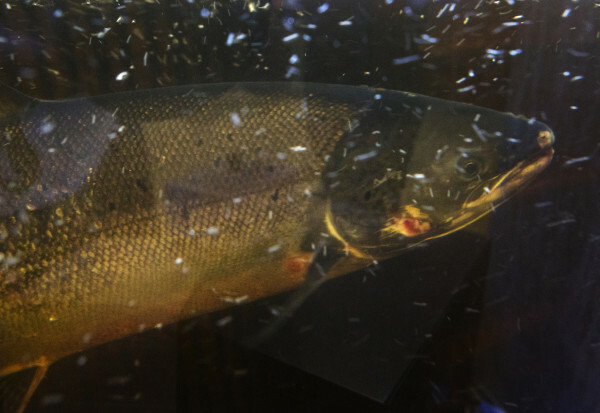 An Atlantic salmon is seen through a viewing window as it makes its way to a holding tank where it will be tagged at the Milford Dam fishway at Brookfield Energy in Milford Wednesday. After more than three decades capturing Atlantic salmon at the Veazie Dam, that operation has moved to Milford, where a new fishlift was unveiled in 2014. John Carlucci (left) and Mitch Simpson, biologist, move an Atlantic salmon to a holding tank to take samples at the Milford Dam fishway at Brookfield Energy in Milford Wednesday. 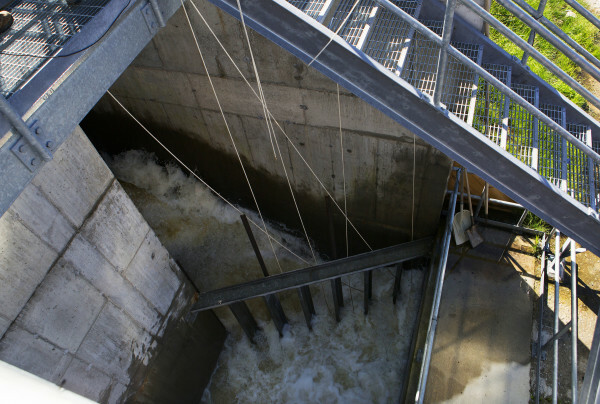 After more than three decades capturing Atlantic salmon at the Veazie Dam, that operation has moved to Milford, where a new fishlift was unveiled in 2014. Mitch Simpson (left), biologist, takes a scale sample from an Atlantic salmon at the Milford Dam fishway at Brookfield Energy in Milford Wednesday. After more than three decades capturing Atlantic salmon at the Veazie Dam, that operation has moved to Milford, where a new fishlift was unveiled in 2014. Mitch Simpson (left), biologist, measures the length of an Atlantic salmon at the Milford Dam fishway at Brookfield Energy in Milford Wednesday. After more than three decades capturing Atlantic salmon at the Veazie Dam, that operation has moved to Milford, where a new fishlift was unveiled in 2014. 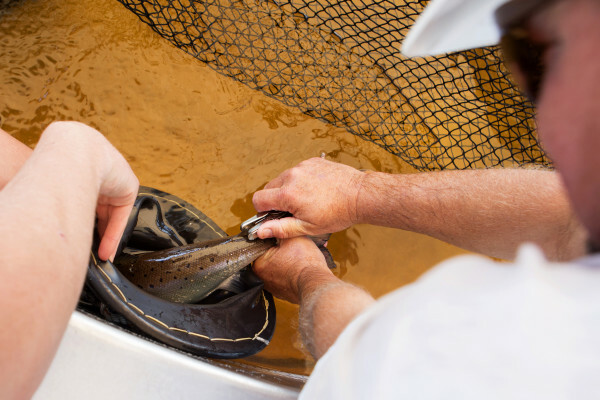 Mitch Simpson (right), biologist, takes a fin sample from an Atlantic salmon at the Milford Dam fishway at Brookfield Energy in Milford Wednesday. 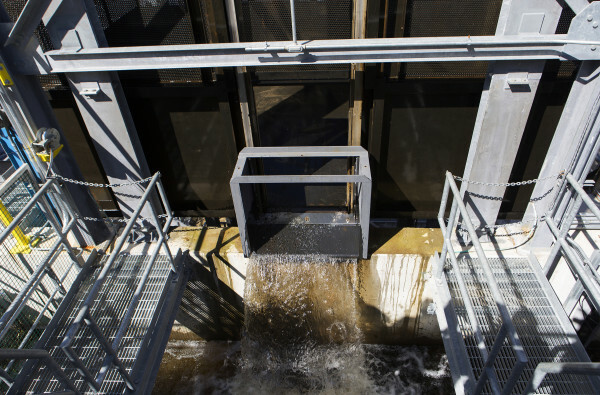 After more than three decades capturing Atlantic salmon at the Veazie Dam, that operation has moved to Milford, where a new fishlift was unveiled in 2014. MILFORD, Maine — A year ago, while fisheries biologists were monitoring the most dismal return of Atlantic salmon to the Penobscot River in at least 35 years, Richard Dill admits he began to wonder about the role a brand new fish lift was playing. “We were anticipating a low run, based on what we had seen the past couple of years,” said Dill, a biologist who works for the Maine Department of Marine Resources’ Division of Sea-Run Fisheries and Habitat. But week by week the number of returnees wasn’t just low, it was historically low, as he and other experts tinkered with flow regimes at a new fish lift at the Milford Dam. That lift took over the role of a Veazie Dam fishway that had been the first upstream barrier to fish passage — and the salmon-counting station — since 1978. But while the dam’s owners — Brookfield Renewable Energy Group — and DMR biologists struggled to find out whether salmon were just avoiding the new lift, they found evidence to the contrary. 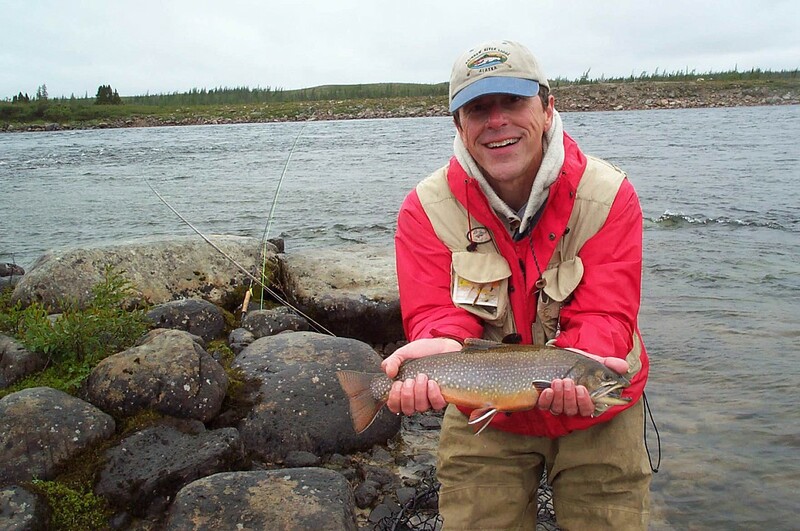 “[Brookfield and the University of Maine] were conducting passage studies, so we were taking salmon [that did make it to the lift] and putting them back downstream,” Dill explained. 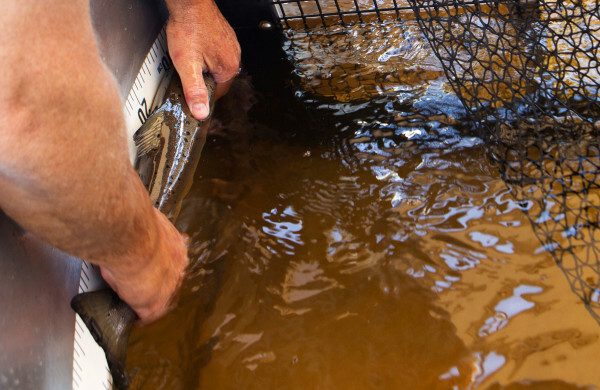 The object of the study was to count how many fish would continue their trip upstream and end up in the fish lift a second time. On Wednesday, Dill said 105 more fish have been tagged and monitored this year, and 85 already have made it back through the fish lift. Better yet, biologists already are on their way toward doubling last year’s return total, as 457 Atlantic salmon have returned thus far. The Milford Dam fish lift project took about 18 months to complete, and construction finally wrapped up in July of 2014. 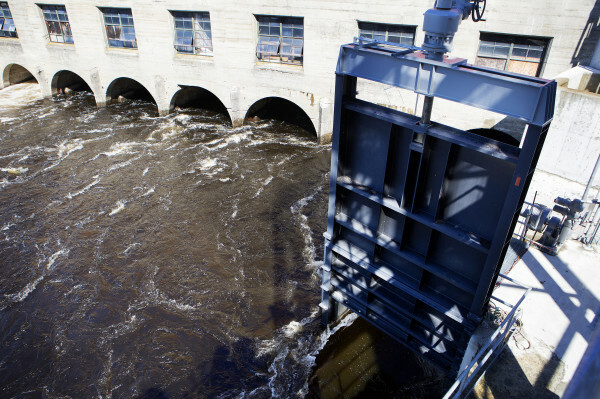 The improved fish passage was a component of the Penobscot River Restoration Project, which called for the removal of two dams and an a fish bypass farther upstream, in Howland. The project has opened up hundreds of miles of upstream habitat to fish that were unable to pass barriers before the dams were removed. Fish are drawn to an “attraction flow” of water they seek out and end up swimming into a cage where they can be monitored through a window and via an underwater camera. 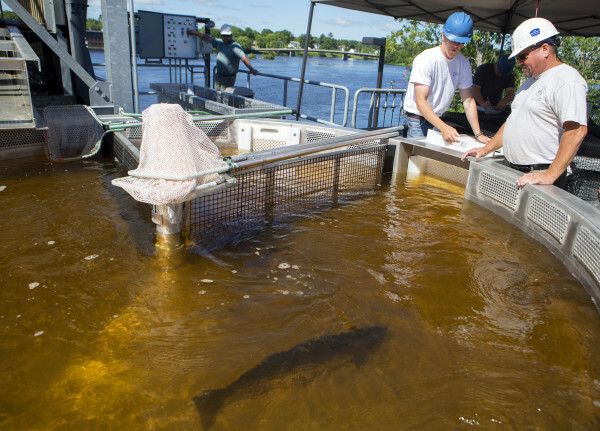 American shad are counted and allowed to swim straight through the fish way, according to Dill, while Atlantic salmon and river herring are lifted in a water-filled elevator and sorted. 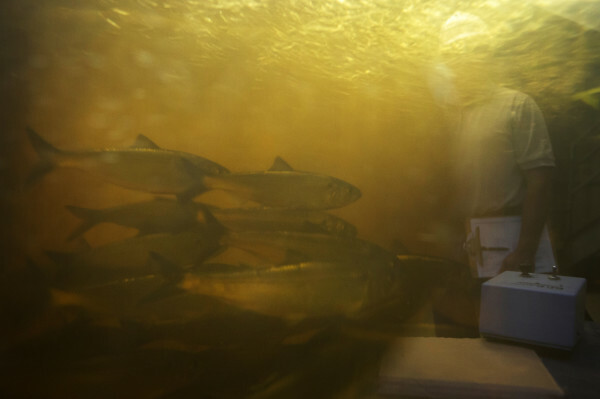 The river herring have been stocked in upstream lakes and ponds, while many of the salmon are taken to Craig Brook National Fish Hatchery to serve as broodstock for the next generation. The water-filled “hopper” holds 5,000 gallons and is automated. On Wednesday, it was set to lift fish every 20 minutes, with crews standing by, ready to react. The versatility of the new facility is impressive, Dill said. In one major way, the new fish lift is a huge improvement from the former fishway at Veazie, biologists said. In addition, biologists have lifted, sorted and transported 587,361 river herring at the Milford Dam this year. Beginning in April, Kevin Job joined the crew at the dam as Brookfield’s lead fishway technician. He works side by side with DMR biologists and helps monitor the flow that all hope will attract fish into the fish lift. That’s not always a simple task. A few days ago, the Penobscot was running at 8,000 cubic feet per second at the dam. After Tuesday’s thunderstorms, that level rose to 20,000 cubic feet per second. The theory? Salmon and other fish are attracted to water flowing at a specific rate. Too high and they have to work too hard. Too low and they turn around and look elsewhere. The goal of technicians and biologists is to make the flow at the fishway the most attractive on the whole river. Kevin Bernier, Brookfield’s senior compliance specialist, is proud of the job his company is doing to help migrating fish move through their power generation dam. And after the Veazie Dam was demolished, the role the new Milford facility plays became essential to the ongoing salmon conservation effort, according to Dill.